From NetEnt, the Planet of the Apes slot is one of the most high-concept games that you will ever encounter. And this is all because this slot essentially combines two for a single gaming experience. After striking a deal with 20th Century Fox, NetEnt elected to develop a single video slot that combined two movies from the franchise: Rise of the Planet of the Apes and Dawn of the Planet of the Apes. This is what has led to two sets of reels being incorporated. 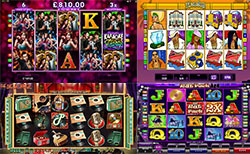 Fundamentally, there are two slot games here, with each having five reels by three rows. And thankfully this does not rack up the cost of wagering. In Planet of the Apes, it can cost only €0.20 to wager across all 20 paylines for both of the slots. That is a most budget-friendly way of playing, but it’s also important to highlight the potential for high rollers, who can wager up to €200.00 on only one spin. • Wild symbols: there are separate Rise and Dawn wild symbols that can substitute for absent symbols in their respective areas. • Scatters: the linking up of either five Rise or Dawn scatters will trigger a 1,000x win. • Dual Feature: this is quite a complex feature, but one that can lead to the transfer of symbols between slot interfaces. • Rise Bonus: land the Rise symbol on the first reel of the first slot interface to gain a coin win for every ape and human displayed. • Dawn Bonus: the Dawn symbol can land on the fifth reel of the second interface and cause all humans and apes to morph into the same symbol. • Stacked Wild: stack three wilds on one Dawn reel in order to copy stacked wilds onto the same reel of the Rise slot. • Rise Free Spins: gain 10 free spins from three scatters while collecting and redistributing wild symbols on the last spin. • Dawn Free Spins: three Dawn scatters can trigger 15 free spins on the far side, while also providing multipliers, extra wilds, or extra free spins. There is a lot going on in this dual slot experience, but Planet of the Apes remains a solid experience that is cost-effective to play. A long list of special features can really make this is a NetEnt slot worth playing.